Do you think the coconut is regaining its position as a high status food? I believe so! 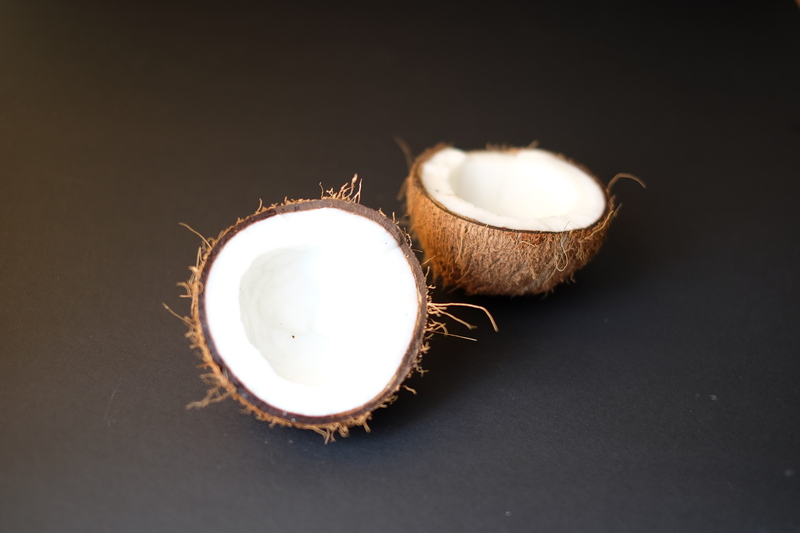 For decades, coconuts were considered unhealthy due its high levels of saturated fat. Recent studies however have suggested that coconut oil has positive health benefits, especially in boosting the immune system. Coconut oil and other coconut products are sold everywhere these days, from health food stores to supermarkets. People from around the world are making a conscious effort to include it in their daily diet because of its many health-boosting potentials. Coconut plays huge role in the traditional cuisines of many tropical countries, especially where I am from – Kerala, the land of coconuts. Coconut oil is used as the main cooking oil, and fresh coconut flesh is used in many ways. In most traditional Keralan home kitchens, a day starts by breaking a coconut and grating it. 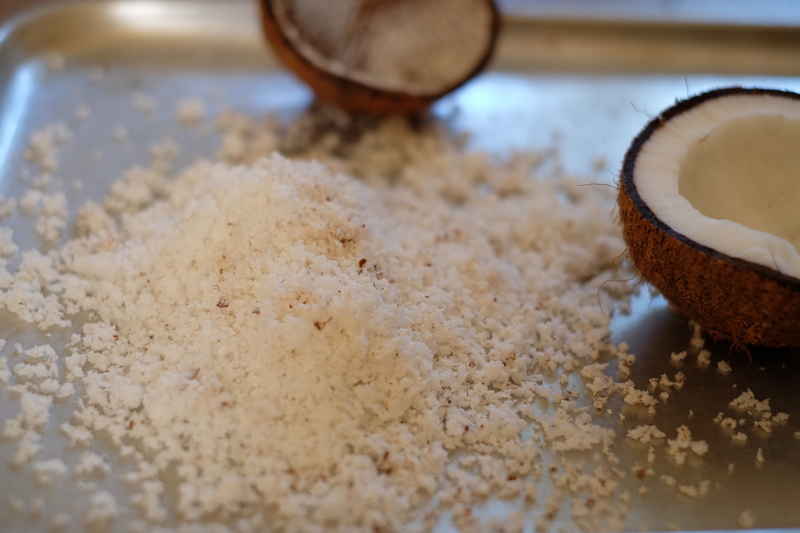 Freshly grated coconut is made into chutneys for breakfast, or ground to a fine buttery paste along with fragrant spices for sauces and curries. On special occasions and for evening snacks, coconut is transformed into various sweet dishes. Growing up, these coconut pancake rolls used to be one of my favourite afterschool snacks! Whisk eggs with salt and coconut milk. Add the above mixture to the sifted plain flour and corn flour in a bowl. Whisk together to make a thin batter. Pour a ladle full of the above batter to a heated nonstick frying pan and spread it around to make a thin pancake. Cook the pancakes in gentle heat and flip it over half way through cooking. 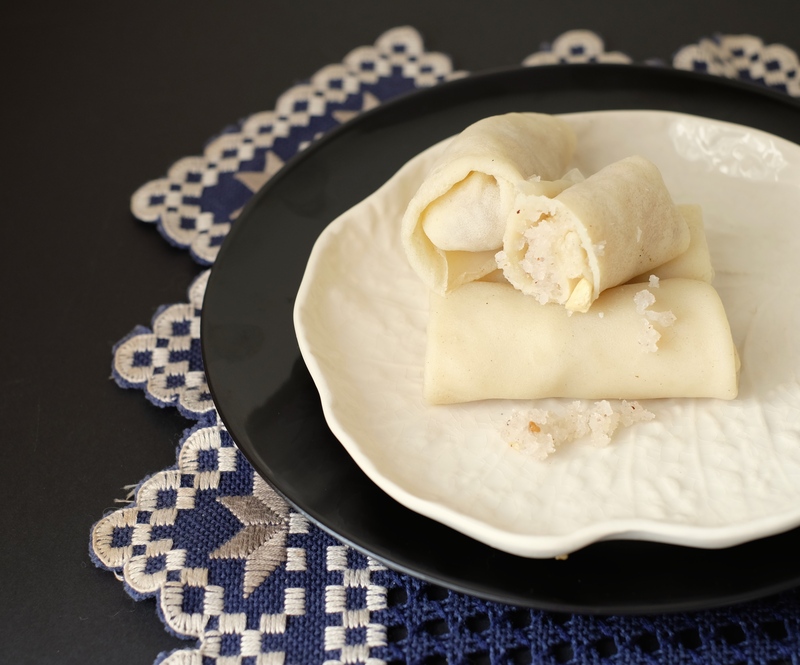 Remove the pancake to a plate when it is ready and make a roll with sweet coconut filling inside. Boil together sugar and water to make sugar syrup. Add cardamom powder, grated coconut and chopped cashew nuts and cook until the mixture is dry.